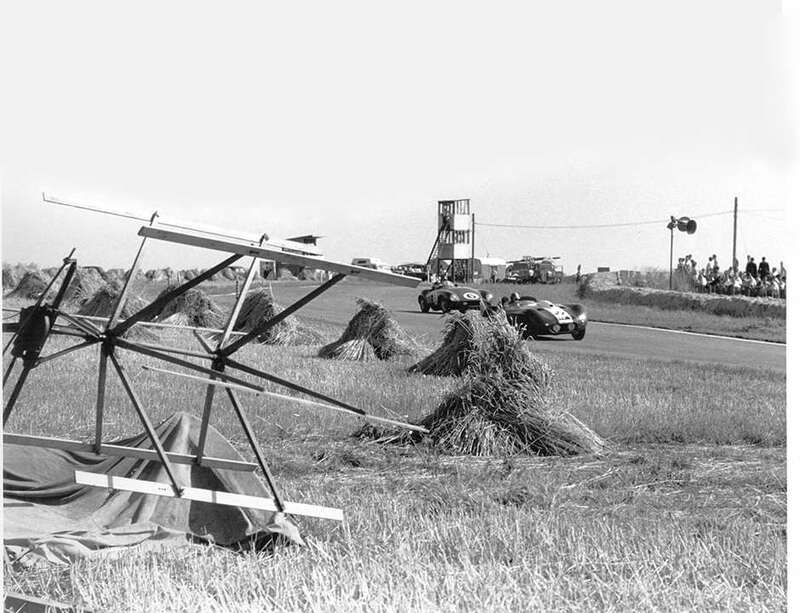 One of the things which set Goodwood apart from the rest, so far as aerodrome circuits are concerned, was that it was always, for a start, a grass field without hard-surfaced runways. And secondly it had a uniquely undulating nature, the old wartime perimeter track’s change of elevation at various points – its gradient – was indeed significant. In combination these two characteristics made our Goodwood Motor Circuit both much more attractive, and much more interesting, than its hard-surfaced aerodrome runway-based sisters like Silverstone, Snetterton, Gransden Lodge, Debden, Dunholme Lodge, Full Sutton, Iblsley, Ouston, Rufforth… and so many more. One really gets some idea of gradient at Goodwood when one exits the first turn at Madgwick. The track surface stretches ahead, wide and indeterminate (especially into the late-afternoon setting sun) and vanishes over a brow just before the dauntingly fast right-hander at Fordwater. You slither through that one reaching towards maximum speed, and the track heads into something of a hollow before the kinked approach to the right-hand element of the St Mary’s ess-bend. Occasionally one or two of our commentators have referred to this right-hander as ‘No Name’ – an out-of-period imprecision which really irritates the hell out of me. It’s not something I ever recall hearing in period before the circuit was closed to mainstream motor racing in the summer of 1966 – yes, we will be marking the 50th anniversary of that sad day this year – and it’s something I actively try to discourage (as right here) today. The truth is that St Mary’s was always an ess-bend and an ess-bend has at least two elements, heading of course in differing directions. In this case St Mary’s is no different from the famous old Esses at Le Mans, or for that matter the terrifying near flat-out Masta Kink on the old bottom straight at Spa-Francorchamps. Ess-bends head right, and they head left – and sometimes right again – and in the case of St Mary’s at Goodwood the course heads right, then left. And that section has a name, and it is St Mary’s – both parts! 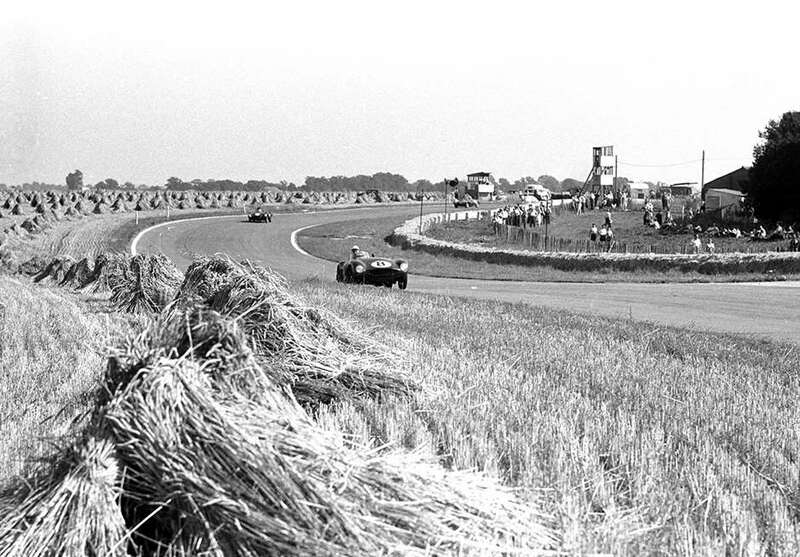 And as you lock left into that second part there’s quite an abrupt brow and the road falls away sharply and the camber changes, and your car is all loaded-up and there’s the marble-strewn outer-half of the track surface and the cornfield beckoning beyond. And you know darned well that if you are going as quickly as you should be, and as hard as you ought, then that off-line area is not one to be flirted with because we so often see spinners there, spiraling back onto the left-side verge and there’s that uncompromisingly finite tyre-faced bank to stop you, abruptly. Between St Mary’s and the entry to the twin-apex right-hander at Lavant the road profile is almost like a hammock, down away from the Ess-bend then rising towards the braking point for the first right-hander. Flat and level then out past the second apex and onto the Lavant Straight – which is about as straight as one of our old Springer spaniels’ hind legs – and then more or less level all the long way back, round Woodcote, through the chicane and on past the pits to return to Madgwick once more. St Mary’s then was a most significant circuit feature and it has certainly been one which became much loved by the regular motor racing photographers. As you can see right here… My old photographer pal Geoff Goddard used to wander far out towards Lavant in his most energetic period during the mid-1950s. Camera gear was really heavy then to lug about. 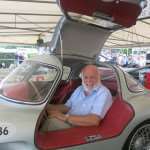 Dear old Geoff always had a very short fuse and I remember one time at the Nurburgring we were roasting in unusually hot sunshine as we went trudging up towards the Karussell corner, when I patted my pockets and asked if, by any chance, he had a pen. It was only a casual, polite enquiry. But the effect was like an ammunition ship striking a mine. Reddening bald head beaded with sweat, laden down with camera bag, spare lenses, different camera bodies, both 35mm and large-format, boxes and boxes of spare film cassettes, Geoff absolutely exploded. He truly bit my head off. I did deserve it. My load for the hike consisted of just a race programme, a note book in one pocket – an apple, and no pen. But it’s noticeable how much at Goodwood – at least in the mid-1950s – Geoff concentrated upon the picturesquely undulating area out between St Mary’s and Lavant corners. And he loved St Mary’s second apex, the left-hand element, with that period commentators’ tower and elevated marshal’s post standing tall upon the corn-stooked infield. There they were protected by a short length of Freddie March’s favoured concrete-beam Goodwood barrier. Not a thing to hit – and completely unacceptable, of course, today – but that’s the way it was then. 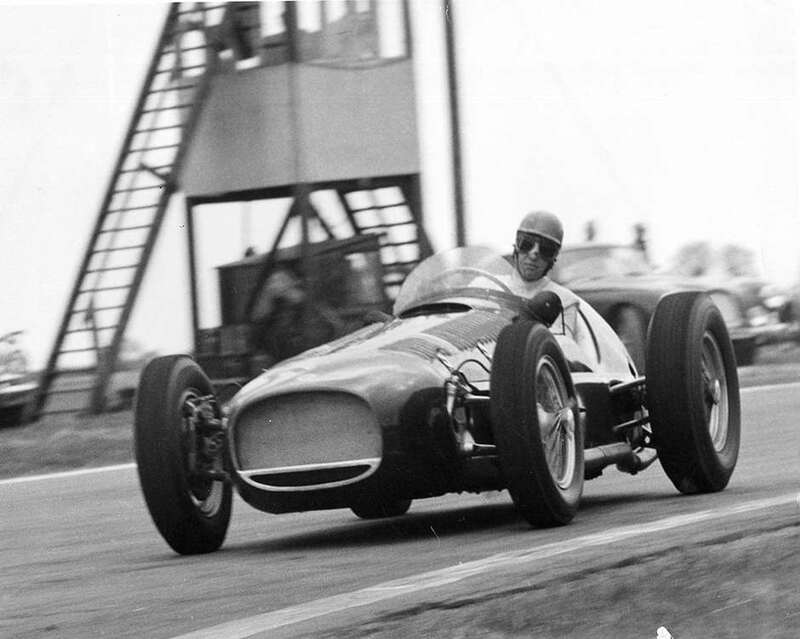 For me, Geoff’s images of the Ferrari 750 Monza hunkering into that post-St Mary’s dip – or of little Archie Scott-Brown in the works Lister-Bristol versus Hawthorn’s Ferrari – an early British flying machine (OK, baler?) in the foreground – capture the charm and spirit of an entire age of high-class Goodwood motor sport. 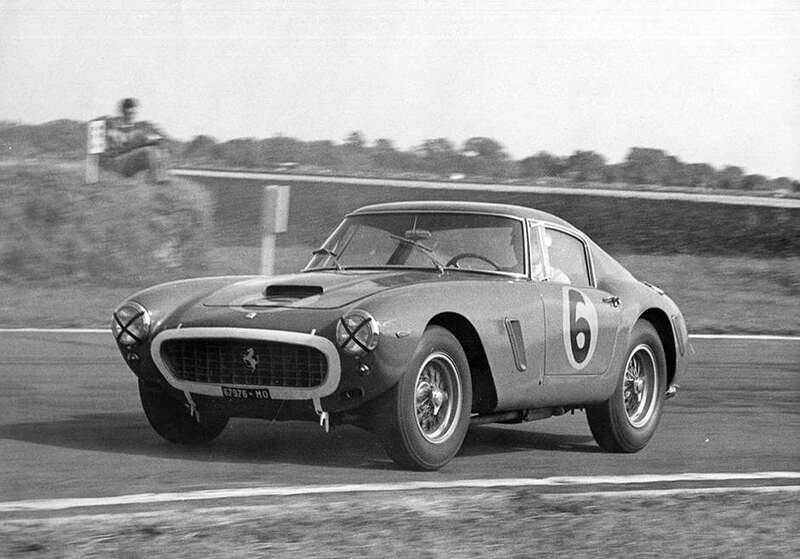 And in St Mary’s itself he always stood a good chance of capturing some of the sport’s standard setters demonstrating their peerless car control, as with Peter Collins opposite-locking the Vanwall Special there – or of Michael Parkes strutting his stuff in the Equipe Endeavour Ferrari 250 GT SWB during the 1961 TT. That particular corner complex, with its undulating approach and exit, certainly was, and remains, a most evocative feature of this outstanding aerodrome circuit. It has two elements, a right and a left – and above all… they should both share the one name.